The otter is as playful and sprightly as it is resourceful and tough. So, the animal was a natural fit when OtterBox founder Curt Richardson and his wife were brainstorming names for the company in 1998. OtterBox’s rugged smartphone cases are designed to withstand the inevitable accidents that come your phone’s way. Features such as dust-proof port covers, scratch-resistant screen protectors, and shock-absorbing foam are dreamt up and executed by OtterBox’s slew of in-house teams, including engineering, marketing, and supply chain. 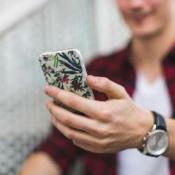 Inspired by their rustic Fort Collins, Colorado surroundings, the folks at OtterBox have used their otter-like creativity and spirit to craft the top-selling smartphone case in the US and Canada. PACKAGING NOTE - Product is brand new and comes in frustration-free packaging.